Just because a vinyl record is too scratched to be played on a turntable, that doesn't mean it can't play anymore! 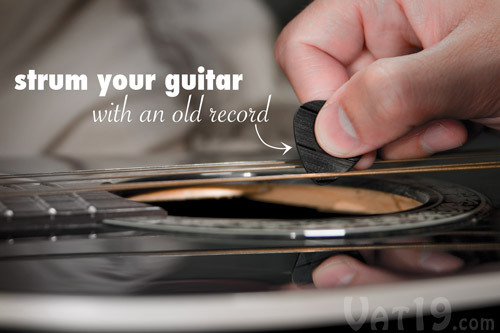 Strum your guitar using our Recycled Vinyl Record Guitar Picks. Each set of six guitar picks is created from discarded LPs that are cut and sanded smooth by hand in the USA. Thickness varies slightly from 1.25-1.55mm. Play music with old music. Literally. Vinyl records tend to scratch easily. When that happens, your Redbone LP can no longer recreate the awesomeness that is "Come and Get Your Love". However, that doesn't mean the record is done playing music! 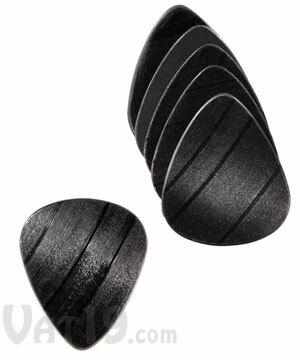 Rock your guitar with our Vinyl Record Guitar Picks. They are hand made from old vinyl records that are no longer playable. Play the guitar (or bass guitar) with picks made from discarded vinyl records. Each Vinyl Record Guitar Pick is cut and sanded by hand to ensure that the edges are smooth and comfortable to the touch. The surface is smooth as well, but still easy to grip thanks to the tiny grooves of the record. They're also very durable and just plain look cool. Due to the manufacturing variances of vinyl records, each pick's thickness will vary slightly. However, they will fall within the range of 1.25 - 1.55mm. This is equivalent to a heavy/thick gauge guitar pick. The picks produce a slightly crisper sound than a standard nylon pick. Every Recycled Vinyl Record Guitar Pick is carefully cut and sanded by hand. Each set of Recycled Vinyl Record Guitar Picks includes six plectrums (which is just a fancy word for guitar pick). 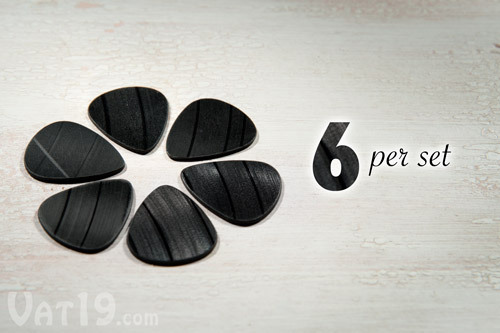 Each set of Recycled Vinyl Record Guitar Picks includes six picks. Smart ukulele that teaches you how to play.